« Jack Reacher, Closet Nerd? This week I went to the National Theatre’s production of She Stoops to Conquer. It broke my heart. What I saw was a crass, shallow, crude peepshow of a play. Brutish Tony Lumpkin tells two wimpy London fops that his stepfather’s old fashioned house is an inn. So they turn up, give orders, treat their welcoming host as an over-familiar innkeeper and decide that his daughter is a barmaid. This is a School of Big Brother production. The audience is invited to smack its lips lasciviously at the ensuing social and sexual fallout. Audience? Gloating voyeurs would be nearer the mark. I wanted to run away. This is where I have to point out that the critics were all pretty keen — “a delight” The Independent ; “a mixture of wit and warmth”, The Guardian; ” fresh, spirited and blissfully funny” The Telegraph. And, to be fair, it is beautifully set and dressed. Susan Kikoler is my guru in all things London theatrical. She goes to everything worth seeing. I consulted her. She hadn’t seen it but was not surprised at my report. She suspected as much from the tone of the reviews — apparently words like “boisterous” and ‘”spirited” are a give away for end-of-the-pier humour. She was not as upset as I was, though. ”It’s a difficult play. I never liked it,’ she confessed. Ah. I went back to the text. Susan is right, of course. Tony Lumpkin’s trick could be cruel. 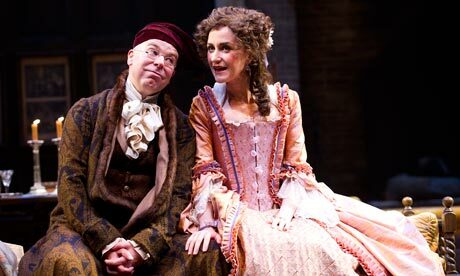 Restoration Comedy was full of heartless toffs tricking the unwary into betraying their inadequacies. Even Sheridan has his cold-eyed moments (Sir Peter Teazle’s realisation that his country wife has betrayed him can be heartbreaking, in the hands of the right actor.) But Goldsmith is different. His characters can be pretentious and silly but they are seldom completely self-deluded — even poor old Mrs Hardcastle knows, really, that she is not forty any more. Above all, they are generous. Even naughty Tony. At least I think so. and I have always loved these people. I love the battle between countryfied ways and town polish. I love the real affection that Squire Hardcastle has for both his wife (struggling with advancing age and a cheerfully rebellious son) and his clever daughter, in spite of being a little too overtly the master in his own house. 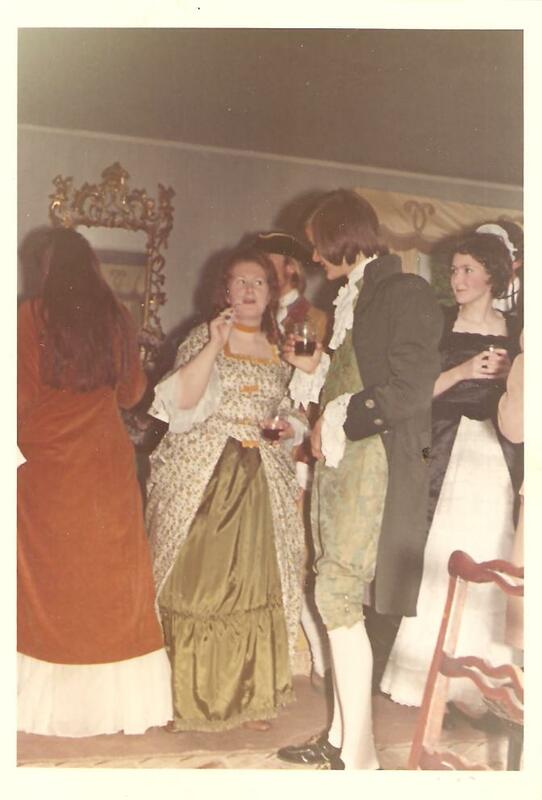 And, anyway, he isn’t; his servants talk back and he lets them; Mrs Hardcastle runs her own show and he lets her; he even compromises with Kate on her clothes – she can have Town furbelows for morning calls as long as she wears his preferred simple country dress for dinner time. I love Tony Lumpkin, a sort of Tom Jones in the making, a wild boy with his rural mates who knows he’s too immature to marry his cousin but is fair and generous to her in the matter of her inheritance. Above all, I love poor awkward, stammering, boastful, unwary Charles Marlow who, under the gentle encouragement of a well spoken inn maid, manages to find equilibrium between what he feels and what he can bring himself to declare to the world. And what did I find at the National Theatre? For socially insecure young men, one of whom is a bit of a swot, we had cowardly fops (“beyond camp”, said my Companion gloomily but with justification, “pure Up Pompei”). Instead of the quicksilver mischief of Tony Lumpkin, we had the threatening leader of a gang of rural thugs. For that sound judge of true worth, lively Kate Hardcastle, we had a wind-up merchant channelling her inner pole dancer. Nasty and not in the spirit of the play, which was first performed in 1773. 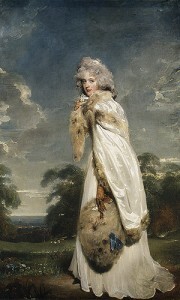 Elizabeth Farren, the 18 year-old Kate who took the Town by storm in 1777, had a twenty year career playing Portia and Hermione as well as Lady Teazle and similar roles; then married the Earl of Derby. Her demurely pretty portrait was painted by Thomas Lawrence. And that’s what I was missing in this production. The wisdom. 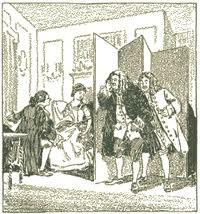 After their first disastrous exchange of tangled high sentiments (pure biography, I suspect, poor old Goldsmith! ), Marlow gets away and Kate Hardcastle muses, “He has good sense, but then so buried in his fears, that it fatigues one more than ignorance. If I could teach him a little confidence …..” You think, that’s a sensible, affectionate girl who sees into the heart of things. They’ll do all right. So yes, I am in love again. Reading Goldsmith again. Going back to other eighteenth century writers. I suppose if it weren’t for last Thursday, I would not be. So, for that at least, dear National Theatre: thanks guys! I think. Oh, that’s so irritating for you, Jenny. 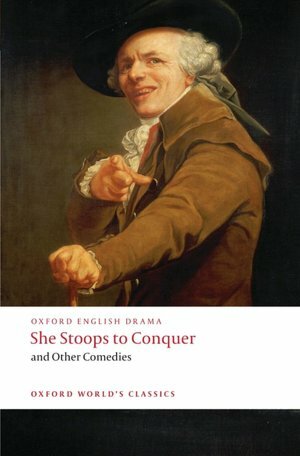 I’m cross because the Theatre Royal at Bury St Edmunds was going to put on She Stoops To Conquer this season, but didn’t BECAUSE of the National Theatre one. Too much money involved in production to risk on thin audiences because everyone might have trotted off to London to see it. It would have been lovely in that perfect Georgian theatre, too. But to be fair it may have been the right decision. All the critics seemed to like the National Theatre one, so people will presumably have gone to it in their charabanc loads. Just hope they weren’t as upset as I was. I’m sad about the production because I’m sure that all the actors had it in them to deliver the real thing, humane and funny and generous. I loved the byplay between Young Marlow and Hastings when the former, chucking orange peel about to prove how badly he was behaving in the “inn”, inadvertently lobbed a large chunk down the back of Hastings’s neck. Genuinely funny; the actors held it together with true professionalism, barely a tremor, though the inner giggles must have been tearing them apart, and I had a moment of hope… But no. Jenny, is that last one of the Hugh Thomson illustrations? I love his work but I didn’t realise he’d “done” SSTC. Oh yes! and rather more affordable than this (http://www.abebooks.co.uk/servlet/BookDetailsPL?bi=7181103546&searchurl=an%3Dausten%26kn%3Dpeacock%26sortby%3D1%26tn%3Dpride%2Bprejudice%26yrh%3D1895) which I covet covetously.